SEO, short for Search Engine Optimization, should be a fundamental part of your search marketing strategy. It is essential in maintaining a strong digital presence, especially in this day and age when the majority of buyers hit the Internet to find products and services. There are over a billion websites on the Internet today, so it can be pretty easy to get lost in all of that. By properly implementing an SEO program, you will have a much better chance at standing out from your competitors. Because there is so much competition out there, much more is required to get your website ranked in a top position nowadays. The techniques to achieve this, the right way, take a significant amount of time and effort. Compared to other ways you can boost your digital presence such as pay per click advertising and social media marketing, investing in SEO has a very good return on investment. It is totally fine to use multiple avenues in terms of paid digital advertising, but make sure your SEO is one of them. At the end of the day, everything you put out in the digital world comes back to your website. Does content marketing actually have anything to do with SEO? The answer is yes! Although the two are completely different from one another, they work extremely well together. You want to produce quality content for your site, using keywords and strategically placing them throughout each piece you create, as well as creating a headline that answers common questions your prospects ask. SEO works off of keywords, so your content needs to employ those keywords. A typical prospect’s purchasing journey is very haphazard, with so many options and channels available at the click of a button, that it can be hard for them to choose which product/service/company is the right one. It usually starts with search. They read reviews, compare and contrast competitors who offer similar products, download whitepapers, and look at your social channels. 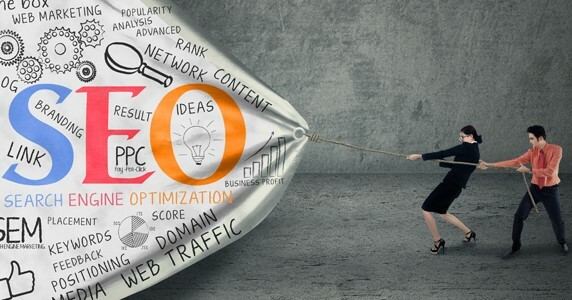 By properly boosting your SEO, your company’s site will be shown ahead of your competitors, giving you a leg up and hopefully turning that research phase into a decision to purchase. Smartphones and mobile devices have opened up a whole new level of search marketing. And as more and more people rely on virtual assistants such as Amazon’s Alexa and Apple’s Siri, optimizing your SEO so that it is compatible with voice search is something that should be part of your plan. These new technologies have given birth to local search optimization, which is just another opportunity to take advantage of. Remember, SEO is an ongoing process. With constant updates to search engine algorithms and the introduction of new technologies, it requires a constant effort to keep your company on the first page.